The Venetian is breaking ground into the realm of elegance and high class living. Here we can see a beautiful Venetian showcased in Blue Lagoon (deep blue gel coat). Paired elegantly with travertine pavers, classic patio furniture & white picket fence – this pool looks quite snug and cozy in this marvelously adorned outdoor living space! Add all of these design features together and you’ve got a pool shape that encompasses most of what our average shopper is looking for. The Venetian is intended for backyards that range from small to medium sizes. It’s overall length of 28′ allows this pool model to fit snugly in most backyards. 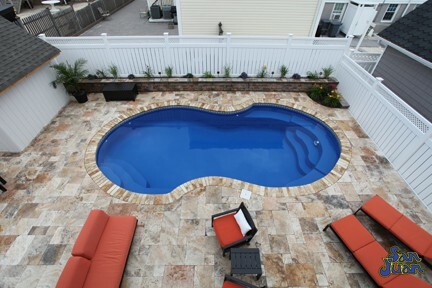 To compliment its frame, the total water volume of 9,500 gallons provides plenty of swim space with easy maintenance. All in all, the Venetian is in a league of its own. It’s part of our modern pool design family. 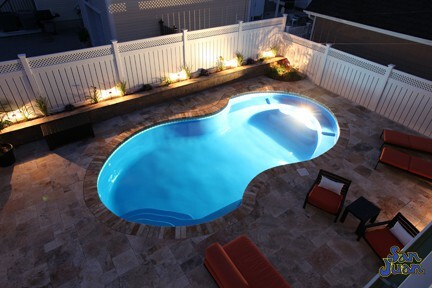 Here, we classify modern swimming pools as cutting edge designs that create unique looks for your backyard. We want our clients to wow their family and guests with fun shapes that never go out of style. 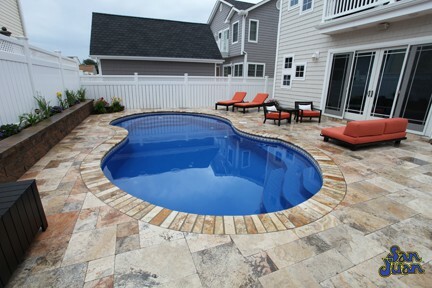 Hence our emphasis on providing over 100+ pool & spa shapes to choose from. If you’re into modern decor, the Venetian is perfect for you. 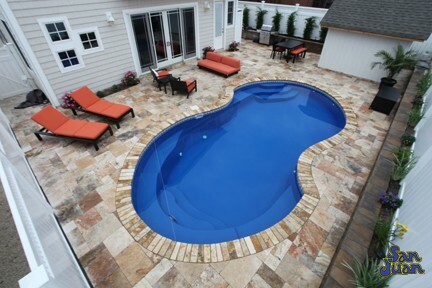 We recommend pairing this swimming pool with a beautiful set of travertine pavers (similar to what’s shown above). Secondly, you can’t go wrong with our beautiful gel coat finishes. Our Blue Lagoon (also shown above) is our most popular gel coat finish. 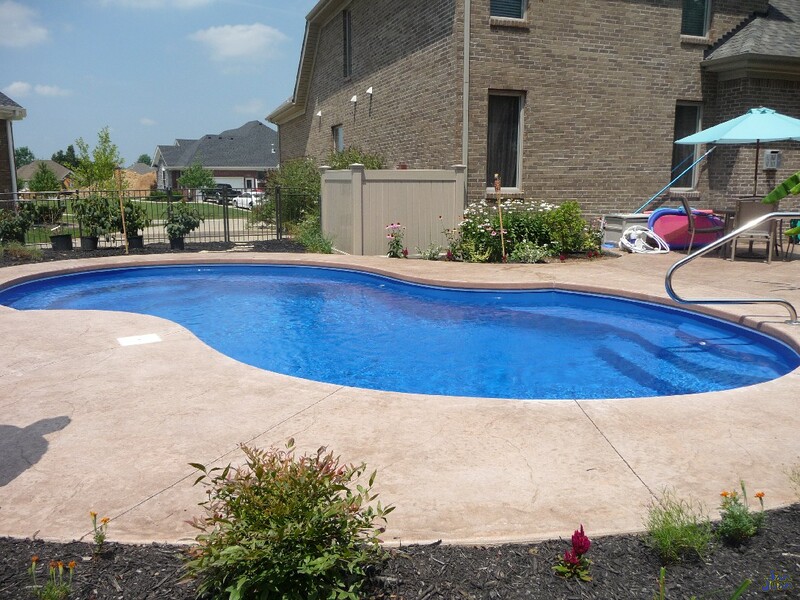 Its blue is striking and provides a perfect contrast to light colored pool decks and is sure to make a design pop! 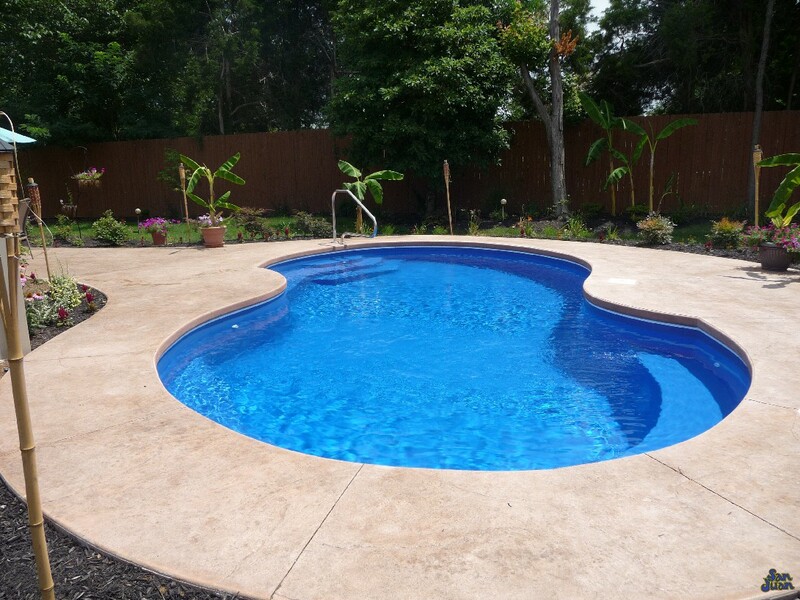 You’ll love the way that our fiberglass pools really bring your backyard and outdoor living space to life! 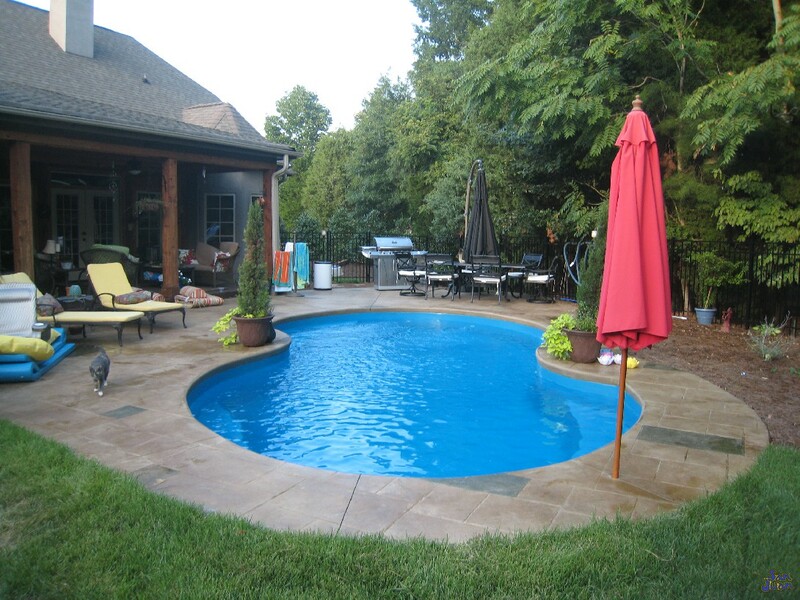 In conclusion, the Venetian is a widely popular fiberglass pool design that’s been a focal point for our clients since its inception. Our engineers crafted together a great design that provides plenty of fun packed features you’re sure to love. From our elegant curved entry steps, located on opposite ends to beautiful free form layout; the Venetian is both elegant and modern. Lastly, its conservative size of 9,500 gallons and overall length of 28′ provides the swimmer with plenty of space, while not stealing too much of your backyard real estate. You’re sure to love the Venetian for all that it has to offer!